Good looking Sterling they have there! Side note: it always grinds my gears to see people paint over sirens without properly disassembling them, but that's just IMO. Yea that was a surprise to see! Woo! 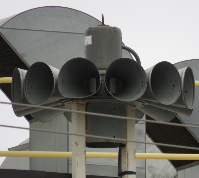 This siren always seemed to sound different from other 2T22s.